The Resolute Support Mission is two-fold; conducting counterterrorism operations and train, advise, and assist the Afghan National Defense Security Forces (ANDSF). 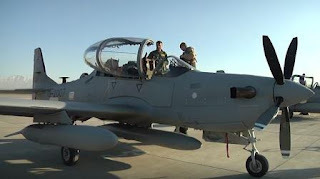 An important part of the ANDSF is the Afghan Air Force (AAF). To do the Train, Advise, and Assist (TAA) mission with the AAF the United States (and its coalition partner nations) has air advisors working with the AAF as part of the Train, Advise, and Assist Command - Air or TAAC-Air. A recent paper provides us with a break down of the essential components of a successful air advising posture, applies it to the mission in Afghanistan, and concludes with a summary of key points and suggest areas for improvement. The authors of the paper are Lt Col Aaron Tucker of the USAF and Colonel Aimal Pacha Sayedi of the Afghan Air Force. Read Advising the Afghan Air Force, National Defense University Press, January 1, 2016.